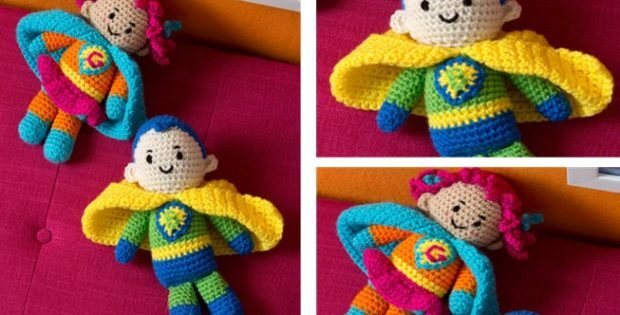 Make these smashing crochet super hero toys for a special little one. They are embroidered with the letter “G” for girl and “B” for boy. However, that is not compulsory. You can personalize them with your favorite monogram. The designer responsible for this fantastic crochet pattern is Michel Wilcox over at Red Heart’s website. She has written a very detailed crochet pattern with a lot of blocking tips on how to crochet these amazing super hero toys in one size. Each of these little buddies measures approx. 10.5 inches in height. In metric measurements, the finished size of these gorgeous super heroes should be about 26.5 cm tall. In the last page of this great pattern you can find 2 diagrams of two different stitches – couched & satin. You can download the crochet pattern written for these lovely super heroes for FREE from the Red Heart website.